Come visit Lombard Park District’s annual Holiday Lights in Lilacia Park. 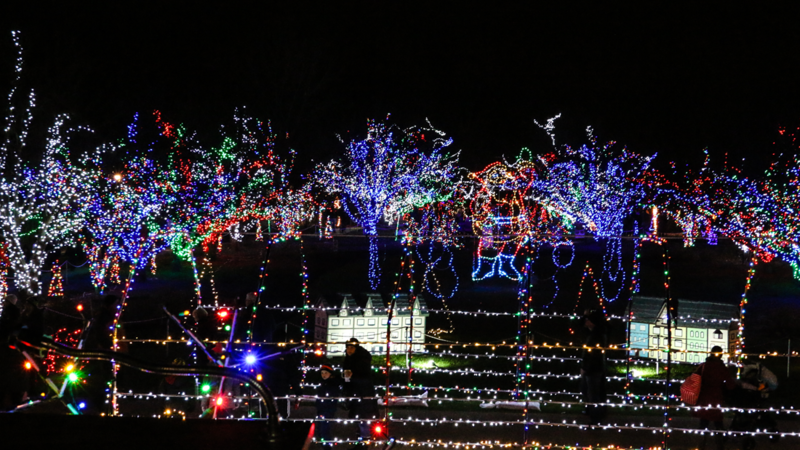 Enjoy breathtaking displays with thousands of lights covering all of iconic Lilacia Park. Special holiday fun will be offered in the park on the dates listed below until December 23. The lights will be turned on every night at 4:15 pm through January 2. This means that there will be no lights on in the park on January 2. Volunteers Needed! The District is looking for groups to decorate trees in Lilacia Park. Contact Katie Manheim at 630-620-7322 to register your group. Free visits with Santa and train rides. Free visits with Santa and train rides. Complete a Victorian craft in Mrs. Claus’ Cupboard brought to you by the Lombard Historical Society. Free visits with Santa and train rides. Come meet Rudolph and receive your very own Rudolph nose! Free visits with Santa and train rides. Complete a Victorian craft in the Mrs. Claus’ Cupboard brought to you by the Lombard Historical Society. Free visits with Santa, Mrs. Claus and train rides. Polar Express Night in Lilacia Park. Every participant will receive their very own bell.